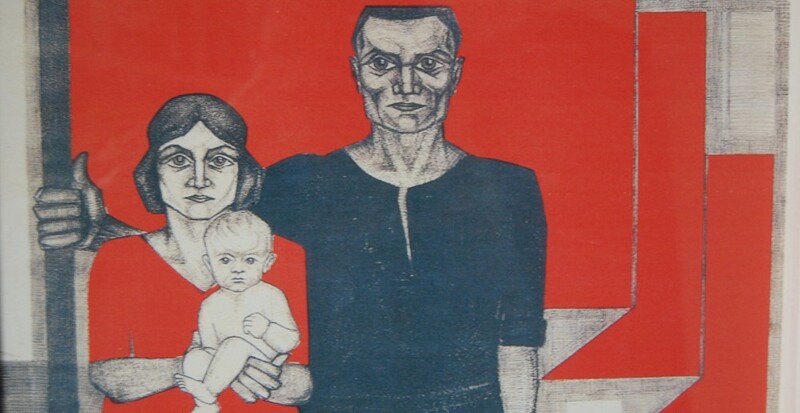 Some years ago I read a book ‘Against all Hope’, by Hermann Langbein, an Austrian who had fought in the Spanish civil war against the fascists. It was the story of resistance in the Nazi concentration camps by one who had been prisoner, including in Dachau and Auschwitz. I had anticipated being inspired by stories of this resistance but was instead humbled by the most common of all resistance activities – the struggle to survive. So when I went on holiday to Germany I wanted to visit a concentration camp and did so by going on a guided tour to Dachau, just a short trip outside Munich. There it was driven home that such was the indescribable oppression, for some survival was not the form of resistance taken. Instead a number of prisoners ran onto the grass at the perimeter of the camp and were literally cut to pieces by heavy machine guns from the guard towers. As our guide explained, this was not so much suicide as the one and only act of self-affirmation some prisoners felt they could take. In every other respect they were crushed; ripped of dignity and of control of every aspect of their lives. Every part of existence conspired against all hope. For survivors this choice of their fellow captives was not an act of cowardice but an assertion of the only freedom they felt that they had left. Our guide was a young Irishman who was serious and perceptive and through the numerous answers to our questions demonstrated a deep knowledge of not only the Dachau camp but the associated history, including that after liberation. His intelligence was demonstrated not only in the questions he answered but those he did not. He pointed out that the pictures on display were taken by the SS guards. In these the viewer looks down on the prisoners who are in regular rows with adequate clothing. We cannot see their eyes which are in shadow. We see shaven heads. As he later explained; when prisoners first arrived they took their clothes off, were doused in often searing pesticide, had their hair cut by blunt shears so ineffective the prisoners doing the cutting often simply ripped the hair off. Then they were shaved. If they did not work quickly enough their hands would be tied behind their back and they would be hung from beams in the shower room. Only the location of the beams’ insertion into the wall is now still visible. In this position their shoulders, elbows, wrists and arms would often break. In a camp dedicated to work or death this, I imagine, could only have one outcome. The new prisoners would then have to rush to grab clothing and clogs before leaving this area. Our guide gave the example of one young prisoner who grabbed a jacket so small only one button could be closed, trousers too short by a distance and two clogs, one which was half the size of the correctly fitting one. This prisoner described his clothing as continued torture throughout his captivity. Worse, such circumstances increased the danger. Anyone that stood out in any way; who attracted the notice of an SS man for any reason – an unfastened button or a new high number – risked the danger of deadly attention. This could, for example, mean an SS guard throwing a prisoner’s cap onto the grass and being ordered to retrieve it. Stepping onto the grass meant machine-gunning from the guard tower while refusal to follow an order meant death. He explained that we could not go into the guard towers because the survivors of the camp, responsible for its existence today, require that visitors cannot go anywhere prisoners could not go. It would not be possible to view the camp from the viewpoint of the guards, not because the experience of prisoners in some way was to be recreated, but because no facility that would allow neo-Nazis to seek some sick thrill would be provided. He told the story of the three hundred Luxembourg policemen who refused to swear allegiance to Adolf Hitler and who were sent to Dachau as punishment. When they arrived they were ordered to do so again in the main square. When they again refused seventeen were selected at random and executed. The same ritual was held every year. He told the story of Hans Beimler, the Communist Party member, who became a special prisoner held in the ‘Bunker’, one of the few remaining original buildings in the camp. He escaped by killing his SA guard, putting on his uniform and walking out of the camp. A few years later he died in the battle for Madrid during the Spanish Civil War. He told the story Johann Georg Elser, a religious worker who was a keen defender of workers’ rights who had voted for the Communist Party until 1933. In 1939 he planted a bomb in a Munich beer hall where Hitler was due to speak. Hitler was due to fly back to Berlin that night but because of fog it was thought he should take the train so he left earlier than planned. The bomb missed Hitler by 13 minutes. Elser was caught, severely tortured by the Gestapo, and incarcerated in Dachau. Hitler planned that when the war was won he would be put in front of a show trial and executed. Just a few short weeks before the end of the war Hitler ordered the killing of Elser and he was shot in the bunker at Dachau. Our guide did not sentimentalise the camp or its prisoners. He pointed out the hierarchy within the camp and the persistent policy of dividing the prisoners. What was most new, to me at least, was the history of the camp since the end of the war. This was symbolised by an art work in the camp showing the different symbols – pink , red or green triangles or two different coloured triangles overlapping each other so that they looked like the star of David, used to identify and mark the different categories of prisoner. Our guide cautioned us not to regard the prisoners in this way or to take the view that this was in many ways an accurate categorisation, even in its own degenerate terms. Unfortunately this art work has some missing coloured triangles because of current objections to their inclusion in the memorial. I can’t claim to have a confident recollection of what these were but they may have included the black and green triangles of ‘asocial’ and criminal prisoners. Our guide pointed out that the concentration camp was only a relatively small part of the whole and the much larger part was the SS training camp. Today it is a training camp for the German police. In 1972, for the Munich Olympic Games and because of the widespread media attention this would bring, the authorities knocked down parts of the site and built a mound between this training camp and the concentration camp. In this way it would not be possible to view the training camp and it would perhaps not arouse questions. This is now covered in grass and trees today. A campaign involving survivors succeeded in getting part of this removed so that today you can see, but not enter, this camp, and see one of the original but otherwise unremarkable buildings still in existence. At the far end of the concentration camp lie three churches as memorials to the victims. Due to cold war politics the thousands of Soviet Union soldiers possibly murdered at the camp are represented by a Russian Orthodox church outside the perimeter. The Jewish religious site is smallest and situated in the farthest corner from the entrance. The Protestant one is in the other corner to the left, larger but low level and of a similar grey concrete colour as the foundations of the barracks in their two rows, which are all that is left of the original buildings. The Catholic church is by far the largest, siting in the middle of the other two in a grass site with trees. Our guide pointed out that plans were afoot at one time to cover the rest of the site with grass and trees but again campaigners stopped this. While not explicitly expressing this, the contempt for this attempted simultaneous appropriation and erasure was clear. The final part of the visit was to the new crematorium which contained a gas chamber. Our guide stated that historians disagreed whether this chamber was actually used but that survivors affirm that is was used on a number of prisoners. 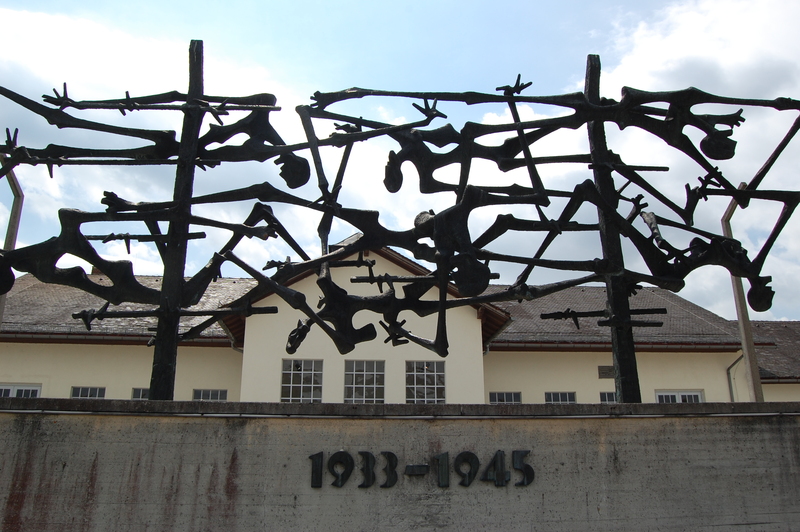 What is not in doubt is that so many were murdered in Dachau that the original policy of carrying many of the dead in trucks into Munich for burning could not be continued and new crematoria needed to be built to destroy the thousands killed. Beside the gas chamber and crematoria was a memorial in three languages vowing never again. As our guide thanked everyone for coming to visit Dachau he noted that in Bosnia it happened again. For me the danger of it happening again is an inescapable potential within capitalism. Holidays are a time to recharge the batteries. There is more than one way of renewing the energy to continue the struggle for socialism and forever making never again a reality.